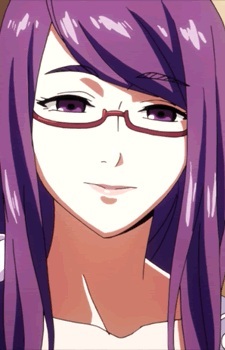 Rize Kamishiro is a ghoul that was hanging out at Anteiku. She set her eyes on Ken Kaneki, but moments before eating him, she died in an accident and her organs were transplanted in Ken Kaneki, making him half-ghoul. It is later revealed that she is still alive, and held captive by Akihiro Kanou: the doctor who transplanted Kamishiro's kakuhou into Kaneki. He is using her to create more artificial or "half" ghouls like Kaneki.